Self-harm refers to the act of cutting and burning oneself and is an addiction that is widely misunderstood. When a person is a self-harmer they engage in compulsive and obsessive behaviours which involve physically harming their bodies in an attempt to avoid feelings that they feel overwhelmed by and unable to cope with. 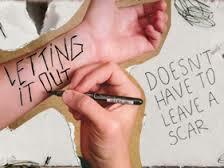 Self-harming can include cutting, burning with cigarettes and general acts of physically harming one-self, such as punching one self, pulling your own hair, or hitting ones head against a wall repeatedly. Self-harm can also be accompanied by other addictive tendencies, especially drug addiction and eating disorders. Just like drug addiction and alcoholism the self-harmer has an incurable and progressive disease which can be managed through therapy and treatment. Some signs that you may need help with self-harming addiction: Have you ever been hospitalised as a result of your self-harming? Do you cut, burn or punch yourself as a means of dealing with painful emotions? Do you keep your self-harming a secret because of shame or fear of discovery? Do you often have scars, bruises or burns that you feel you must hide from others? Do you self-harm in order to punish yourself for something that you think you have done? Or for something that has been done to you? Do you feel that you HAVE to hurt or injure yourself in order to stop feeling overwhelmed by your emotions? Have you tried to stop harming yourself but been unable to do so? This is by no means a definitive list, but if you identify yourself as having one or more of these symptoms please do contact me and we can discuss ways in which to help you with your addiction to self-harming.